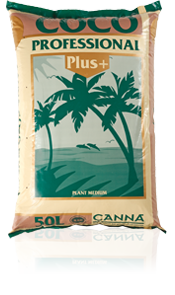 give water daily with the special CANNA COCO fertilizer. if you are not able to give water to the plants daily, use a bigger container. About 5 liters / 1.5 gallon of CANNA COCO fertilizer solution per m2 /10 sq.ft. a day (for full-grown plants). For bigger plants use a minimum of 5 liters/1.5 gallon. Using a bigger pot provides you with a more stable root environment. keep in mind to provide sufficient means of drainage in your pots. Possibly use a thin layer of CANNA Aqua Clay Pebbles at the bottom of the container for proper drainage. CANNA COCO's water/ air complex contains 73% water and 23% air. Furthermore, the coconut grind is pre-buffered according to a special procedure. This is necessary to obtain an optimal growing condition, assuring the best development potential of your plants.